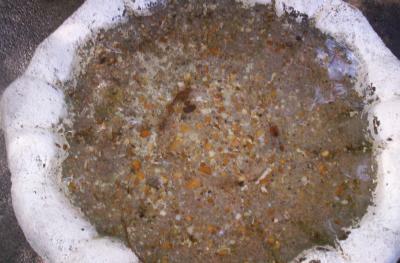 I have an old stone birdbath that has mold on the inside. Any clues as to removing it? I don't want to replace it. I agree with lsfm, bleach is what I would use. A little bleach and a scrub brush should do the trick. Once its clean, use bleach about once a month to keep it clean. Make sure to rinse it well before filling it for the birds. Bleach is the best. To rinse it I would put the hose in it, weighed down with a brick, and let it run for five minutes. Thanks to everyone, here it is after the mold was removed. Thanks to all, I cleaned it but good. Water has never looked so good, I imagine the birds will like it also. My mother in law had this same problem. After she washed (hard) it really clean, she left it to dry. Then she purchased a safe paint in blue and painted only the bowl area up to where the water would go. This was several years ago and it still has not needed repainting, nor has it gotten moldy since. And, the birds are really attracted to it. I don't know what caused it to get moldy to begin with. She always takes it in during the winter when the water freezes up anyway, and sets out smaller trays for them to have. And, she would clean it very often. But, gratefully the problem has been solved. 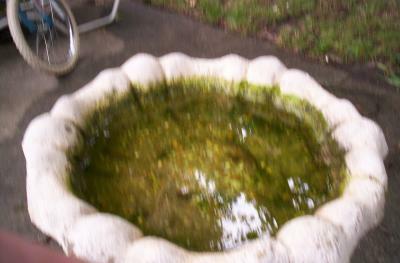 If your birdbath is close to your house you can hose the dirty water out. then you can bleach the bath and hose the bleach water out. If you are afraid of bleach residue rinse with vinegar. It neutralizes bleach. If your climate is sunny and dry for any extended period of time, remove all water/moisture and let the sun do a natural "bleach" to kill the mold. Rinse out with clean water before refilling. Repeat as often as necessary.